We have already written an article about vang tension downwind. But we still receive many questions and comments on the videos on our YouTube channel and the official SportVid library. A lot of these questions involve the sail setup and especially the correct vang tension. These questions vary from, “Do I have to change my vang when I’m out on the water?” to, “Do I have to change my vang with every up- or downturn I make?” Most of the questions we answered individually by mail or in the SportVid app. However, we still decided to publish an extra article to clarify the use of the vang in downwind sailing. Yes, you have to use your vang while sailing! Some of our fans explained that they like to tie the vang at the ‘right’ tension before(!) going on the water. This is not the way to go. To get the maximum fun and joy out of your Laser you need to adjust your vang tension. If you are not used to adjusting the vang, start with easing the vang when reaching and sailing downwind, and tighten the vang on the upwind. In the video we explain the range of the correct vang tension. The more experienced you are, the more you will start to narrow this range. Start with relatively big adjustments and narrow this down as soon as you get a better feel for the different vang settings. As we explain in the video you will be able to see and feel the difference between ‘too tight’ and ‘too loose’. One of our more experienced fans asked, “How many times do I need to adjust my vang during a downwind?” It is important to know that the initial setup of your vang tension is no different for experienced sailors than inexperienced Laser sailors. 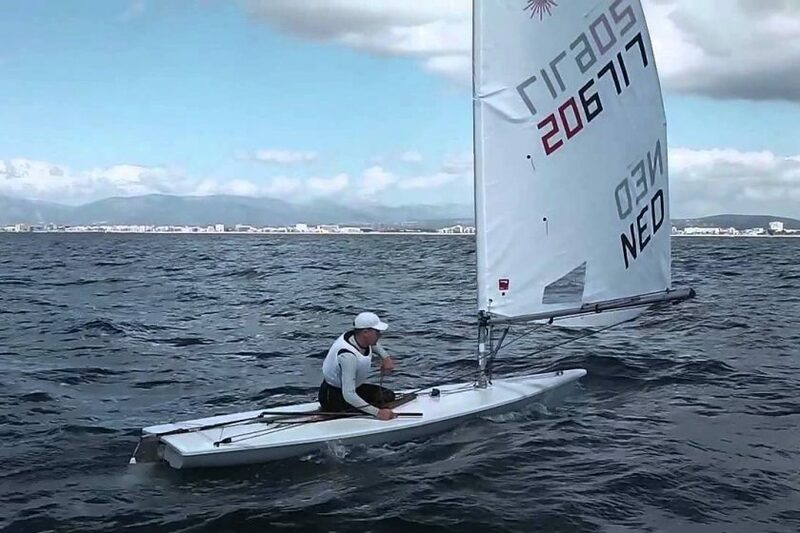 However, for the more experienced Laser sailors that are used to adjusting their vang on a regular basis, it is important to be active with your vang tension. As soon as the wind increases, your leech will open. This needs to be compensated by tightening the vang. Keep searching for the “movement” in the leech. As soon as the wind decreases, you need to ease the vang. The same goes for a change in direction. It is almost impossible to keep changing your vang setting with every movement you make. However, as soon as you change your direction for a longer period of time, it might be worth it to adjust your vang setting. If you are choosing a direction that is more “reaching orientated,” make sure you tighten your vang slightly. As soon as your direction is more towards a downwind angle, you need to ease the vang. These adjustments are really small and really subtle. Always search for a perfect moving leech.